Do your ancestors come from Kent? 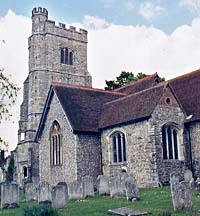 If you are researching the history of your English family in Kent and need some professional help, please contact me. I have been researching in Kent since 1978. Since then I have built up a great deal of specific experience with Kent local and family history research sources and research methods. We are fortunate in Kent in that there is very good survival of the basic genealogical source material - and plenty of material to fill in biographical details as well. My research covers all types and periods of records, including those in Latin, and I can provide transcriptions and translations of both Latin and English documents of any period. I am happy to undertake research at all the record repositories and libraries in the county. When a family line is traced out of Kent, I can still proceed with the research by using local agents but direct the research myself. Where London record repositories are concerned, I personally do the research in them. My hourly rate for research in Kent is £25.00, which includes expenses except postage and the cost of any certificates or photocopies obtained. I have no minimum charge and accept commissions both small and large, from the search for a specific event to a full family history. For the latter I find it best to work in stages, the length of which are agreed in advance with the client, reporting my progress and including suggestions for further work at the end of each stage. On receipt of a commission I aim to have my first report ready within 2-6 weeks, depending on the nature and complexity of the research required. I also offer a consultancy service to those tracing their own family history, perhaps to those who need a little advice on local sources or who have got 'stuck' and need some suggestions as to what to try next. My hourly rate for this service is the same as for my research service above. During the course of three decades' research in Kent, I have compiled numerous indexes that provide essential reference tools for all Kent researchers. These indexes (listed at left) are available for searches and are an important resource for all Kent researchers, both amateur and professional. To learn more about any index, just click on the index title. These indexes are constantly updated, as my research continues. I also offer a variety of publications to assist the Kent researcher. Many records of use to family historians are now available on the Internet but they need to be used with caution. Many, especially census records, have been transcribed and/or indexed by people unfamiliar with Kent, its surnames and place names. Websites rarely point out gaps in the records which they have included, which can sometimes be filled by reference to sources not available online but which are available to a local researcher. And on a website there is no guidance available to interpret the records you do find. Please feel free to contact me if you have questions about these services or would like to discuss a possible research project. Additional details about research services are available by clicking on Contact Us. Best of luck with your Kent research!